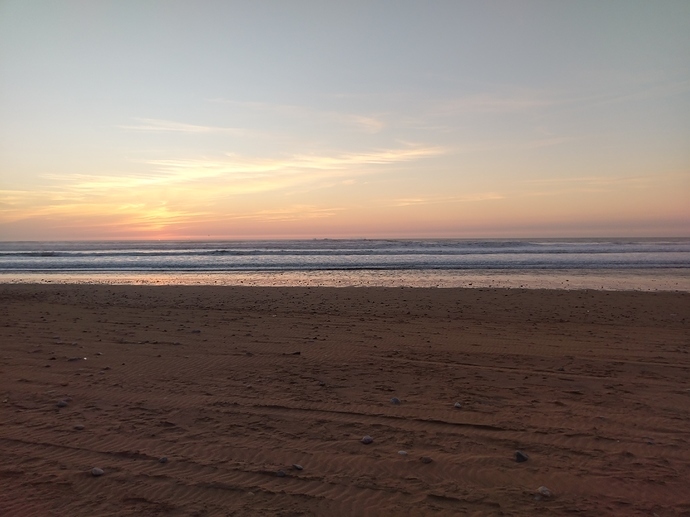 The openvillage is slowly getting started here in Sidi Kaouki, and here is a summary of what have been done in the past 3 weeks and where are we heading, Besides some useful info and links to facilitate your stay. This is actually a photo of the sunset not a sunrise from the beach,but let’s just assume it is a sunrise to use it as a metaphor for starting the openvillage in Kaouki. These are the main links in order to navigate and know your place in the openvillage house here in Sidi Kaouki, These are 2 wikis and a dynalist so you are welcomed to add and edit them. In the house Manual wiki you can find practical info for the house; how to reach it, essentials needed to live in house, and how to leave it to reach nearby towns and villages. In the house activities wiki you can find info about the people who are living in house, sleeping and working arrangement, It is the place to go to propose your activities/workshops and sign up for the other activities proposed as well. The Dynalist is where we organize our tasks, general ones like shopping, and project oriented ones. Check the #shopping tag to see if you can bring something with you before coming and assigned to yourself. The place here is extremely quite, you can see from the map that except for 2 or 3 houses there is almost nothing around. It is a very relaxing place with the ocean just around the corner. The village practically has no night activities, and most of the shops and “restaurants” in the “center” are closed as well, except for one Cafe or 2. so if you are welcomed to bring board games, cards, movies, music …etc. Don’t forget to add it on the Dynalist mentioned above. It gets a bit cold by night so don’t forget to bring a warm jacket with you. Matthias and I have been living here for the past 3 weeks, we had quite some fun in some trips to Essaouira and of course in cooking several experiments. [ a wiki for daring cooking recipes might follow soon]. Here is a summary of what we have been doing. Basically secure the basic materials needed in order to live in the house. you can see the development in our dynalist. The space is ready for you to arrive. We can figure out together the optimum use of the space according to the group needs. @hadeerghareeb started the first aid wiki so we can fill our pharmacy with the needed stuff. 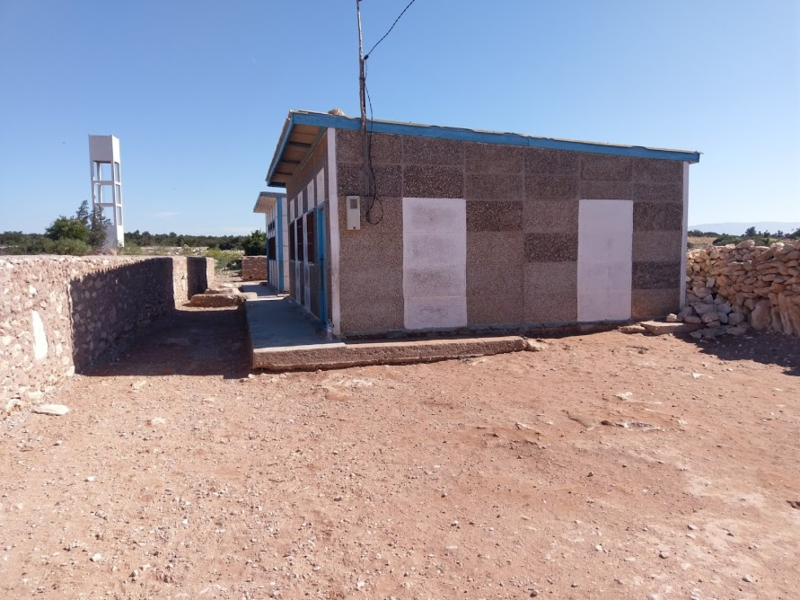 There are some unfinished buildings around Sidi Kaouki, there are at least 3 near our house, and some others near the center. we still have no idea about the owners and why is these buidlings uninhabited and unfinished. This info might be useful for a potential openvillage academy in sidi kaouki for a longer term. There is a trash market ( used parts flea market ) every Sunday in Essaouira. It is a nice place to find spare parts, tools, cooking utensils, some electronics …etc, it ends at a regular trash market where there is even and art corner inside. Getting tools is still an ongoing process as there are some tools that we will need and don’t have yet. 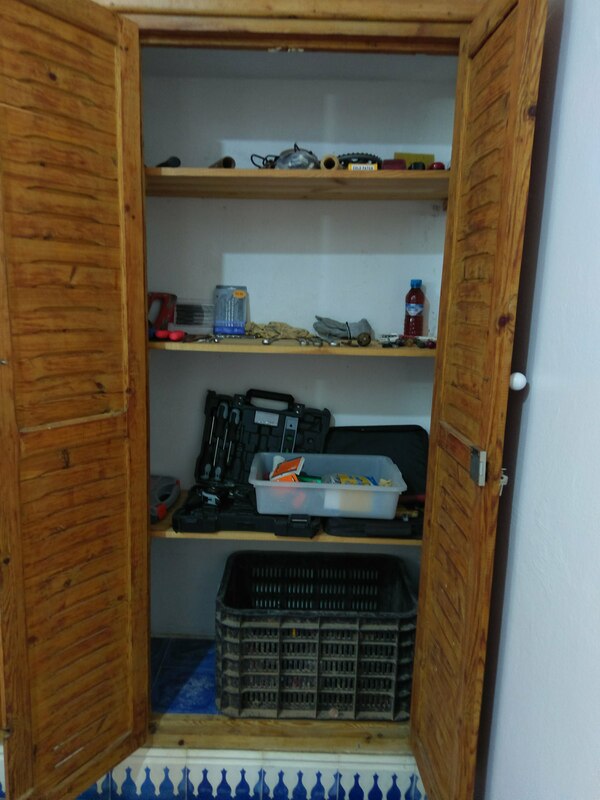 Also preparing a nice workshop space to be done near the local technique room. we got in touch with someone in Essaouira who has a 120*120 cm CNC machine that we can rent and use. We meet up with a local initiative in Sidi Kaouki and touched upon our potential collaboration; specially regarding the trash problem and the school. we had an informal meeting with some young folks starting their own restaurant cafe in the Center, They are happy to get involved in our activities, and join the different workshops, movie screenings…etc. A quick visit to the school to see the status quo, quite a small “school” just 2 rooms with a small empty area as a playground. A charitable organization from Casablanca should have connected Electricity and fixed the bathroom this week. @alberto already arrived and made us some delicious italian food. February is the time where most project teams arrive and we get into action. In the first 10 days we have already the local radio workshop planned and the initiation of the coffee sorter and BitCut project. Thanks for the status update. Looking forward to day 1 of the coffee sorter. But we need some music here. @johncoate can you look through the Dynalist (Look for the “live and work environment”)? I have made a small entry about music. But you want like a bluetooth speaker or some other portable that I can carry over? Ok I will see what I can do. Might have to get it at an airport since I won’t have much other options between now and Sunday when i leave.